I don't know if I've emphasized my personal dislike of having to use the phone. So that's why it's amazing that I spent 15 minutes on hold Monday while calling the cable company about our connection. I told them that the cable was on the ground, they said that they'd come fix it later this week, but that the cable should be fixed that night. Lies! It's two days later and it still doesn't work. 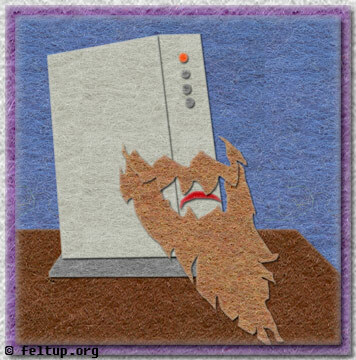 This is my cable modem, it has grown a beard from lack of use. I'm not sure if that even makes sense, illustrating the craziness caused by lack of internet.